PROFESSIONAL women’s football was brought another step closer on Wednesday 15 June and for south-east superstar Ellie Blackburn … she can’t wait to be part of it. With the announcement of the first eight AFL clubs issued inaugural National Women’s League (NWL) licences in 2017, for Blackburn, 21, from Endeavour Hills, it means her beloved Melbourne will get a chance to feature in the first season of professional women’s football in Australia. The Demons are set to battle the likes of Adelaide, Brisbane, Carlton, Collingwood, Fremantle, GWS and longtime rivals the Western Bulldogs in the start-up competition. For the former Beaconsfield junior, it means the world to see football change dramatically in just the time she’s been involved and see another new avenue arise. “It’s pretty amazing to see how far it’s come over the years – when I started you wouldn’t have ever pictured something like this happening,” Blackburn said. “It was a childhood dream and now it’s a reality. “It’s a reality for so many younger girls that will be able to get this opportunity now as well. With the pathway from Auskick all the way to the NWL, Blackburn thinks it will help dramatically shift community perception of women’s footy and get parents behind their daughters’ footy hopes and dreams. “It’ll be a lot better for girls and a bit more welcoming for them to come into it and for their parents as well to come in and say ‘now you can make a future out of this’ and that’s something they can aspire to be a part of,” Blackburn said. Blackburn has one match left for the Demons this year – the annual Hampson-Hardeman Cup held between Melbourne and the Western Bulldogs. In a way it closes a door on a pioneering chapter for elite women’s football, with the Exhibition Series winding down to make way for the National Women’s League. But looking back on the closely fought clashes on the MCG and Etihad Stadium, the initial steps the first players and teams went through to make it all happen, Blackburn thought it was incredible to see the game move from a 44-person draft in 2013 all the way to the peaks starting up in earnest in 2017. “It’s good to look back on this era as you say and see what we’ve achieved out of this,” Blackburn said. “It’s going to be a big day for women’s football. “The girls that are actually involved, it will be a big day knowing over the years we’ve had this little competition between Melbourne and the Bulldogs and have a bit of fun there and from now on it will create some kind of rivalry between the two clubs. “Two pioneers and two clubs that were given licences are inaugural clubs – it will be rewarding in a way that we’ll be able to look back on this time and think about how much we achieved together getting this done. 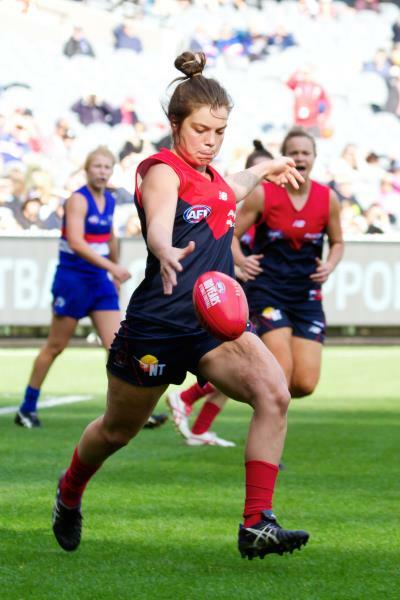 Whether or not she’ll get to play for Melbourne in next year’s competition is up in the air, with marquee spots at each team limited, but wherever she might take her NWL dream, Blackburn was proud to be part of the red and blue through its first four campaigns. “I think it’s great for Melbourne Football Club – we’ve been pioneers of the game for so long and had great people be a part of Melbourne throughout the years to make this happen,” Blackburn said. “If it wasn’t for people involved with that football club, we might not have been looking down the barrel of a women’s competition. The final AFL Exhibition Series clash – between Melbourne and the Western Bulldogs – will be held on Saturday 3 September.